There's an app for that, a website for this, and a software solution for some other thing that you have to do to run your business. The reason this happens is that apps, websites, and software usually focus on doing one thing and doing that one thing really well. But this often means you have to put up with a disjointed workflow that can waste time, effort, and ultimately money. 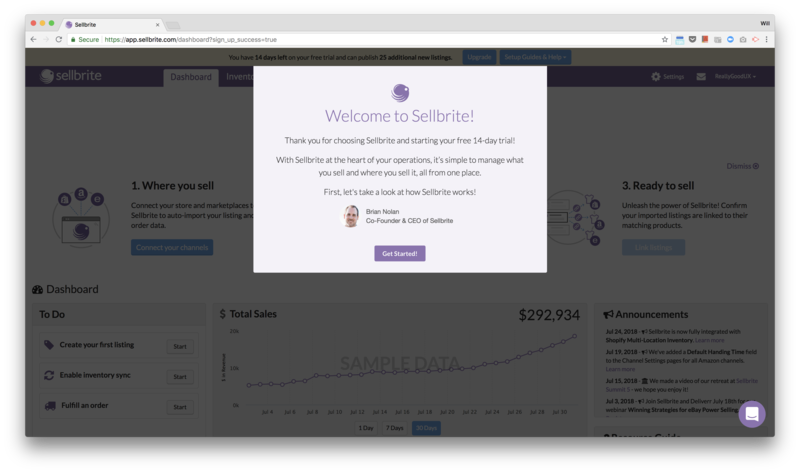 So when you come across a tool like Sellbrite—that does lots of things and does them all really well—you are in luck. 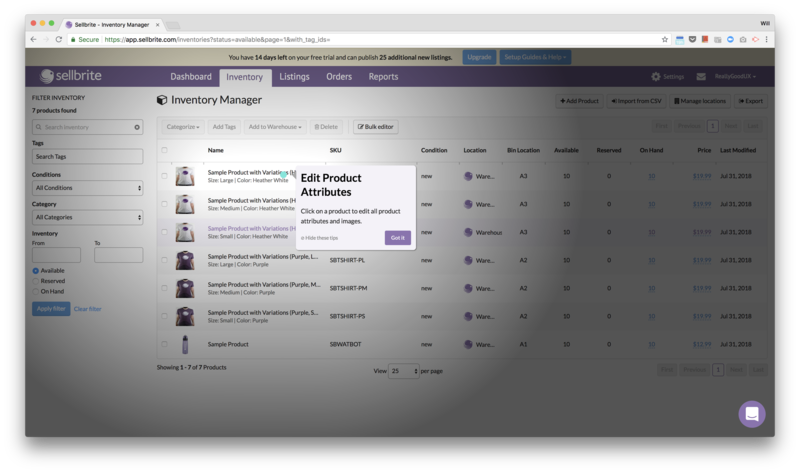 Sellbrite is a multi-channel selling tool that lets users sell and manage their merchandise across a variety of different sales channels, like Amazon, Walmart, and Etsy. But like any other SaaS product, Sellbrite must prove its value to its free trial users as quickly as possible to achieve successful acquisitions. Sellbrite leads their onboarding experience with the face of their CEO: Brian Nolan. This may seem trivial, but human faces are proven to elicit an emotional response in users that can establish relationships and earn trust. Because of this, users of Sellbrite are more likely to start off the onboarding flow with a trustworthy and credibility impression of the platform. To break down the complexity of onboarding a user and getting them set up, Sellbrite breaks down the tasks into three small steps and uses an additional checklist to prompt users to take action. By making the job seem more manageable, users are more likely to start it. And when users start something, they are much more likely to finish it. 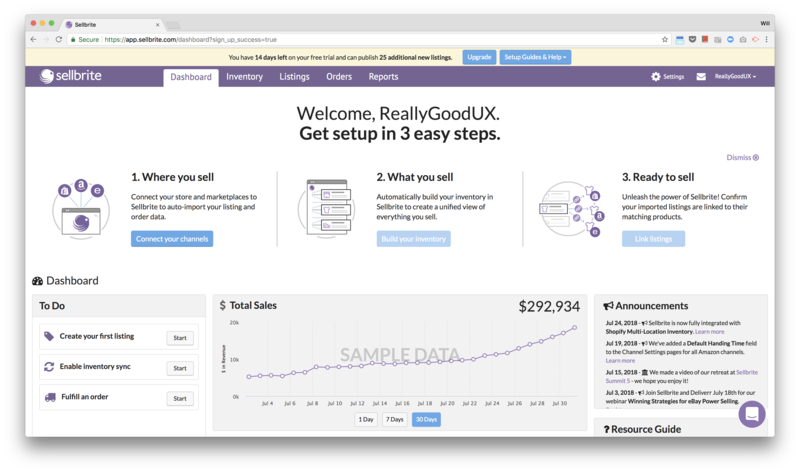 Because Sellbrite's “aha” or “wow” moment comes later in the user journey—once the setup is complete, and sales begin to flow in—Sellbrite uses dummy data to provide an interactive demonstration of what their platform looks like in action. 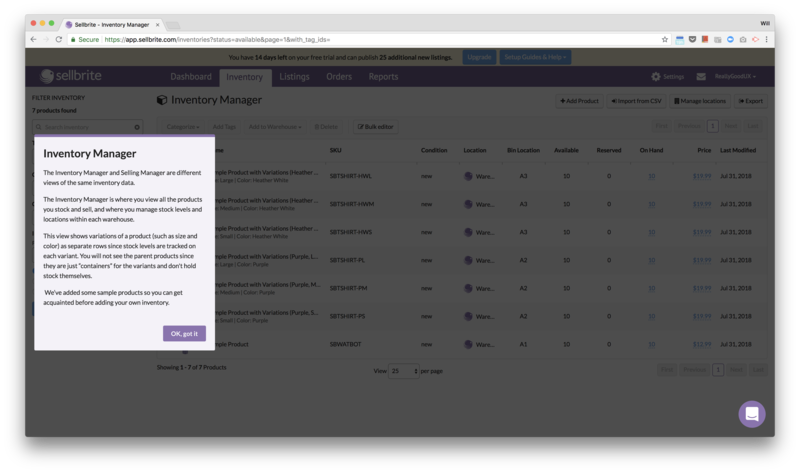 This way, the user can understand the value that the tool can deliver, which gives them the motivation to complete the setup and see it for themselves. Sellbrite is a powerful and multifaceted tool that can seem daunting for first-time users. 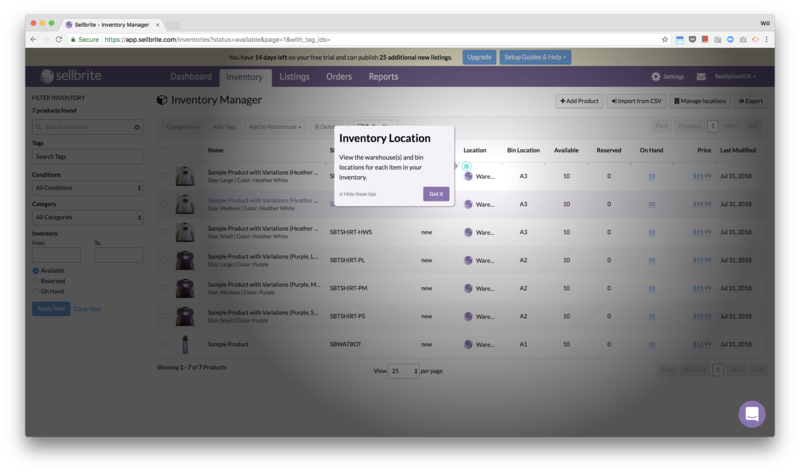 But to keep the user's momentum going and to remove any potential obstacles, Sellbrite uses spotlight tooltips to provide a concise overview of the functionality available in the interface to reduce ambiguity.